It apparently took eight full months for YouTube’s Lazy Eyebrow Reviewer and Masterpiece ReAnimated to painstakingly pose and animate these impeccably-detailed Masterpiece Transformers toys from Takara Tomy and Hasbro to recreate the ‘80s cartoon’s opening animation. The results, which have me itching to buy every last one of these figures, were clearly worth all the effort. 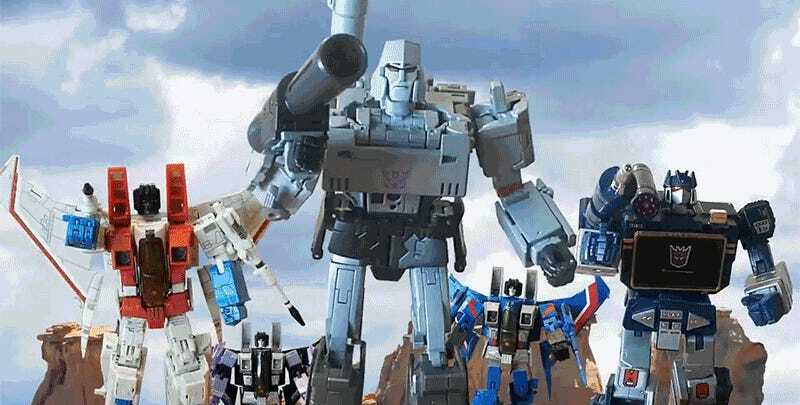 I’m really hoping one of the big networks, or Netflix, gives these folks enough money to recreate the entire first season of the Transformers cartoon using these toys. The low-budget animation style of the ‘80s series has made it hard for me to revisit one of the staples of my childhood, but swap in some toys and I’ll jump out of bed every morning again to watch it.